Clarke and first lady Laura Bush collaborated for 8 years. Here they celebrated their final press preview of the White House Christmas decorations in December, 2008. Vivek Kundra, the executive vice president of emerging markets for Salesforce.com, said he would use his experience and connections to reach out to governments everywhere. Salesforce.com, best know for its sales, customer service and collaboration software for business, is raising its ambitions by aiming at the international businesses and sales to foreign governments that have been the mainstays of companies like I.B.M. 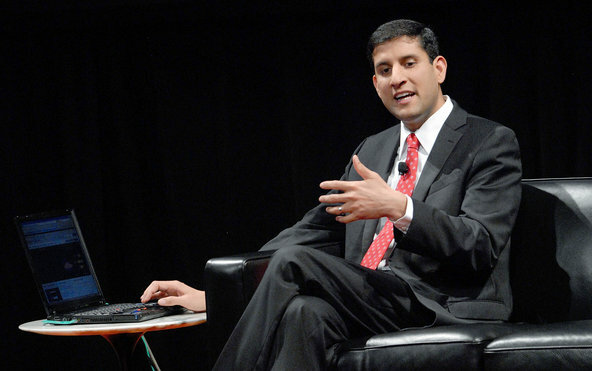 On Monday, the company named Vivek Kundra its executive vice president of emerging markets. Mr. Kundra was the country’s first chief information officer from March 2009 until August 2011. His job was to move the government’s computer infrastructure spending — $80 billion a year — toward cloud computing. Mr. Kundra has extensive experience in technology at several levels of government, and has been a frequent visitor to the technology industry’s conferences. At present, nearly 68 percent of Salesforce’s revenue is from the United States and Canada. Another 18 percent is from Europe and the remaining 14 percent is from the Asia-Pacific region. Africa and the Middle East are not broken out as separate regions. I.B.M., by comparison, has selected Africa as one of its top growth markets. Though his title indicates he will oversee development and sales in places Salesforce barely reaches, Mr. Kundra indicated he would use his experience and connections to reach out to governments everywhere. “The developed nations are all facing challenges in terms of their financial health,” Mr. Kundra said. “They can look at their operating expenses and see Salesforce as a disruptor.” He said that Salesforce would present itself to developing nations as a provider of “new services,” like health care delivered over mobile networks. The overall strategy will be developed over the next few months, he said. Given his relatively short tenure in the federal government, the cost savings produced during his time there was not clear. Mr. Kundra has also worked in similar jobs for the State of Virginia and the District of Columbia, where the installation ofGoogle Apps, instead of traditional office productivity software, was said to have saved about 87 percent. Mr. Kundra has also been an outspoken advocate of sharing government data with the public as a means of creating low-cost information and business software applications. Our young women have dreams of going to college. Last year, the Miss America Organization made available more than $45 million in scholarships to help turn those dreams into reality. I’ve watched lives change because of the scholarships from our pageant program. Here are just two examples of the impact that Miss America can have in fulfilling American dreams — 50 years apart from one another. Crowned 50 years ago, Maria Beale Fletcher was told by her father that it wasn’t his dream that she go to college. It needed to be hers to dream and to fund. Maria promptly entered the local pageant and won $250. She went on to win Miss North Carolina and the Miss America pageant in 1962. With her Miss America scholarships, Maria earned her B.A. in French and philosophy at Vanderbilt University. She went on to become a successful business woman and an advocate for education. As we say goodbye to the 2011 Miss America Teresa Scanlan, we proudly watch her pursue an undergraduate degree in government at Patrick Henry College, followed by law school. Not only has Patrick Henry College offered her a full scholarship, she plans to use the more than $62,000 in scholarships from the Miss America Organization to attend Harvard Law School. We wish her the very best as she pursues her dream to be a lawyer, U.S. president and Supreme Court justice. The Miss America brand is known and loved for helping to fulfill the dreams of our nation’s young women. We are now entering a new era for our organization as we expand our mission to encourage more girls and young women to pursue their dreams of a higher education and to attain the goals that will take them into their future. Following her crowning on Saturday night, the 2012 Miss America will spend her year touring the country to encourage all young women to pursue a college education, and will focus on driving interest in the arts, as well as science, technology, engineering and math (STEM) education. The Miss America Organization will work with national and community partners to create an unconventional approach to driving young women’s interest in STEM. Our efforts coincide with the national momentum to teach STEM curricula outside traditional school settings, targeting female students who are currently underrepresented in STEM professions. Our hope is to help shift girls’ attitudes about STEM and boost the percentage of women employed in STEM-related industries. It’s not just the right thing to do, it is also the smart thing to do for America’s future and our economy. Across the country, millions of little girls have the dream of becoming Miss America. Some of the young dreamers have won the crown and gone on to become media stars and moguls, missionaries and mothers, news anchors and newsmakers, singers and scientists, lawyers, doctors, teachers and preachers… and none of them started with a crown. They started with a dream. The Miss America Organization is so much more than a beauty pageant. It’s a dream machine. So please join us tomorrow night on ABC. When the lights go up and the music begins, you will be a part of something bigger than crowning a new Miss America… you will be inspiring the next generation of little girls who will dare to dream. Sam Haskell is the former chief of Worldwide Television at the William Morris Agency and the current Chairman of the Board of the Miss America Organization. He was named in 2007 by TV Week as one of the 25 Most Innovative and Influential People in Television over the last quarter century. Click the image to watch! Contestants will go through 3 nights of preliminaries and individual interviews with the judges before the finalists are selected live on national television at 9 PM ET on ABC. Judges this year are dancer Mark Ballas (Dancing with the Stars), Emmy award-winning TV personality Raúl de Molina (El Gordo y la Flaca), TV and film producer Mike Fleiss (The Bachelor), producer and TV star Kris Jenner (Keeping Up With the Kardashians), actress Teri Polo (Meet the Parents), fitness guru Chris Powell (Extreme Makeover: Weight Loss Edition) and TV news anchor Lara Spencer (Good Morning America). Will Current TV Anchor Olbermann Return on Tuesday? Dear David Carr, Only you could have such great reporting on Keith Olbermann’s battle with Current TV on production matters that make all the difference between success and failure in television not just on election night. When I saw the story last week about Keith Olbermann and Current TV lawyering up, I couldn’t help thinking, My, that was quick. It was just six months ago that I wrote an article for The New York Times Magazine about the well-traveled anchor’s bold new partnership with Current TV, the low-rated liberal cable channel co-founded by former Vice President Al Gore. I wondered how Current TV and the hot-headed Mr. Olbermann would get along, but back then, it was all hugs and hopeful rhetoric. At a Yankees game I attended with Mr. Olbermann, he said he was looking forward to working at a place where he would hold the title of chief news officer and where the corporate meddling would be at a minimum. Mr. Gore was similarly upbeat in a phone conversation for the article. That didn’t seem to count for much on Tuesday night when Mr. Gore found himself participating in Current TV’s coverage of the Iowa caucuses while Mr. Olbermann was nowhere in sight. Without the star power of Mr. Olbermann and the trappings of a well-financed news outfit, the former vice president looked as if he were trapped in the studio of a midsize public access station. Meanwhile, Mr. Olbermann refused to participate in any programming outside the parameters of his regularly scheduled “Countdown,” a show where he has all but taken himself hostage by broadcasting against a black backdrop. The motif scans as a running protest against the technical problems at the channel, with a candle lit to mark the start of the vigil. That nice, gooey start-up rhetoric now seems very far away. Mr. Olbermann did excellent on-air work for CNN, Fox, ESPN, and MSNBC, but that never stopped him from burning bridges faster than they could be built. It rarely ended well in spite of his skills. As it turned out, past performance was a good predictor of results going forward. Current executives have been reduced to communicating with their biggest talent through his manager and lawyer, with both sides working the media to get their story out. By creating drama in yet another high-profile assignment, Mr. Olbermann could be running out of options, but don’t bet the house on that, given how desperate cable channels are for anyone who can generate ratings, never mind the rough edges. Having worked for big, moneyed cable outfits in the past, Mr. Olbermann was clearly disappointed in the deep technical problems at Current TV, a cable news start-up that had trouble producing live news programming, including “Countdown,” his 8 p.m. show. He declined to lead the channel’s special political coverage until those problems were resolved, but Current TV officials called his bluff and went ahead without him, pre-empting his show in the process. It was a game of chicken in which everybody ended up with egg on their faces. The impasse has been remarkable to behold, even if few people are watching. Mr. Olbermann, who is reportedly being paid $50 million over the course of a five-year contract, had more than a million viewers when he left at MSNBC at the start of last year, but in the most recent ratings period, he was reaching just 200,000 people a night at Current TV, according to Nielsen. He’s been very disappointed in those numbers, and the fact that the channel has hired talent and built out capacity on the West Coast without his input. After a summer of production problems that never seemed to be resolved, a power failure darkened his studio last month. He responded by sitting in the dark. Mr. Olbermann’s contractual rights at Current TV are significant — he has control over the content of his show and his lawyers have argued that the channel has no right to pre-empt it for special election coverage — and management has very little leverage over him. So the channel is left to check his Twitter updates for indications of his mood, which is usually not very good. Executives at Current TV told me they contacted Mr. Olbermann two months before the Iowa caucuses about being the anchor and executive producer of their coverage, and he declined. Mr. Olbermann thought it was silly to attempt to expand coverage when the channel’s marquee show lacked reliable production. But that didn’t stop him from calling in his staff for a news meeting on the day of the Iowa caucuses as if his show were going to appear, when he clearly knew that no such thing was going to happen, a pretty callous stunt by any measure. It fell to Mr. Bohrman to send a memo to the staff saying there would be no installment of “Countdown” that night. Ugly business, that. But if Mr. Olbermann is disappointed in the widespread technical failures at Current TV, it should be pointed out that he helped choose the studio, an old building on the far west side of Manhattan that has turned out to be a lemon. He is a part of the management team, and you generally don’t get to rail against the Man if the Man is you. Executives at the channel say the embarrassing public fight has more to do with his unwillingness to play, let alone play well, with others. Which is kind of a running meme in Mr. Olbermann’s career, but this time was supposed to be different. By enrolling him at a high level in the remaking of Current TV and keeping the bureaucracy at a minimum at the small, privately held company, Mr. Gore and Joel Hyatt, the founders, hoped that the brilliant but chronically oppressed anchor would find the angel of his better nature. No angel has been forthcoming. Instead Mr. Olbermann has expressed multiple grievances through letters from his lawyers. (Problems have only deepened since Mark Rosenthal, a chief executive Mr. Olbermann got along with, left in the middle of last summer and Mr. Bohrman, an experienced news executive, was brought in from CNN.) Current TV wants to be a player in the cable news/opinion world and most especially in the 2012 election, but their production capabilities are not ready for prime time and the man who was supposed to take the lead has barricaded himself within the four corners of his show and, so far, he’s not coming out. Mr. Hyatt, who is also the chief executive of Current TV, did not see that coming when we spoke last May. He was right about the last part. If Mr. Olbermann were simply an employee, they could tell him to show up at 7 p.m. Tuesday to anchor coverage of the New Hampshire primary. They can’t, and he won’t. Vice President Al Gore made a stunning, unexpected return to politics for the 2012 Iowa Caucus as a political analyst for his own cable channel, Current TV. Like the veteran vote counter he is, Gore points out: “It’s no long winner take all before March 1 on the republican side. It stays that way… that is the delegates they will get and it still gives a slingshot effect. The person that wins, gets the prize. It’s still a significant thing to come in first.” No one in politics knows the pain and truth of these words more than Vice President Gore. Welcome back to politics, Mr. Vice President. Tammy Haddad, President, Haddad Media, co-founder, White House Correspondents Insider, and former MSNBC Vice President for Washington. The only people benefiting as much from the debates as the candidates are the shows and networks who are hosting them. Meet The Press, leaped ahead of the traditional New Hampshire ABC News Saturday night debate by cutting a deal with Facebook and locking in the candidates early. Mediabistro’s Chris Ariens gets an early look at the questions sent into Facebook. “Now that Iowa is behind us, it’s on to New Hampshire. ABC airs a GOP debate Saturday night and NBC has one Sunday morning — both with one less candidate — as a special “Meet the Press” and inconjunction with Facebook. MTP goes live at 9amET each Sunday, but airs at various times on NBC affiliates across the country. But this Sunday, the debate will also air live on MSNBC at 9am. At the same time, this page will be up and running for Facebook users to ask questions and share thoughts about the candidates. TV Newser’s Chrie Ariens has the fast nationals for Tuesday’s Iowa Caucus coverage.